A classic Van Gogh; one of the many self-portraits that he made while staying in Paris. This painting shows an evident influence of Neo-impressionism in Van Gogh’s art. 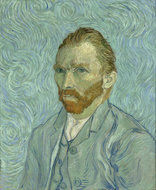 Vincent Van Gogh’s self portraits were his attempt to improve himself as a painter. 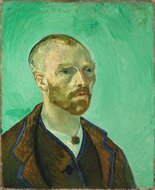 With each of the 30+ self portraits that Van Gogh made, you can see a marked difference in his approach to colours and strokes. By closely studying the changes in Van Gogh’s painting across all his self-portraits, our artists are able to accurately recreate these stunning pieces of art. 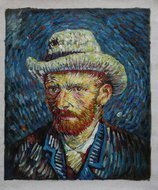 We assure you of delivering a hand-painted Van Gogh reproduction that looks and feels just like the actual painting. Since Van Gogh wasn’t particularly wealthy, it was hard for him to find models for his art. To solve this problem, he invested in a good mirror and started using himself as his muse. 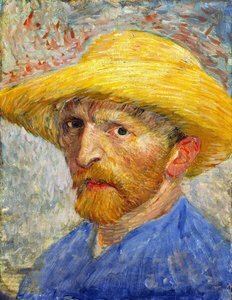 Van Gogh made six different self-portraits where he is wearing a straw hat. The painting shown here was painted by him in the summer of 1887 while he was staying with his brother Theo in Paris. 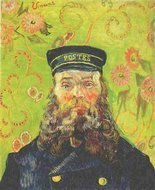 Out of all the other self-portraits that Van Gogh made in Paris, this particular piece is brighter and more vibrant than the others. This may be attributed to the fact that Van Gogh used to paint his reflection exactly how he saw it in the mirror. 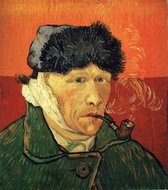 In fact, since this was the painting of a reflection, what we see here is actually the left side of Van Gogh’s face and not the right. This painting also demonstrates Van Gogh’s understanding of Neo-impressionist painting and colour theory.